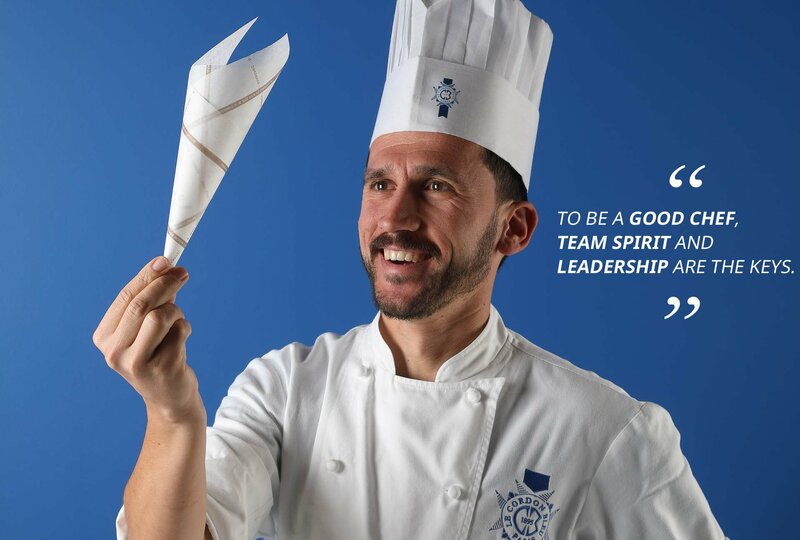 Chef Sinden joined Le Cordon Bleu Paris team of Chef Instructors in 2016, following a career in a variety of establishments. Today, he gets a real sense of satisfaction from teaching his profession to others and particularly enjoys interacting with students. When I was a child, I made cakes every Sunday: my love of food probably ignited my passion for pastry. I then began studying pastry when I was 15. I became a Chef when the opportunity arose and I seized it. I was offered the position of pastry chef at La Réserve, a gastronomic restaurant in Nice. It was a giant leap, I was very apprehensive, scared of not being up to the job. It is important to surround yourself with professionals who have already been through it and can guide and coach you. As a youngster, I spent some time in Paris where I took my “Brevet des Techniques et des Métiers (BTM)” in pastry so that I could further my education. I was an apprentice at the Ritz at the same time which was pretty tough and I eventually decided to switch and work in a pastry shop. I stayed in Paris for 4 years, 2 of which were spent working at Ladurée. My career then evolved in line with the opportunities which presented themselves. I worked for 8 to 10 different businesses on the Côte d'Azur during a 7 year period. It was very rewarding and I strongly encourage future chefs, who aims to become a chef, to have as many different experiences as possible as this will enable them to absorb wide-ranging expertise and become open-minded. Meeting Chef Marc Janodet, with whom I worked at Juana (2 stars in the Michelin Guide) left a lasting impression. He was extremely meticulous and organized but always good humoured. We were extremely willing to meet the exacting standards of our 2 Michelin stars. Lastly, I worked at the Réserve de Nice and the Relais & Château Le Mas de Pierre (5 stars) in Saint-Paul de Vence before rediscovering my profession through teaching. I give pastry classes and demonstrations to students of all 3 levels. I am also a Chef for amateurs who come in search of specific expertise in our culinary workshops. I frequently visit pâtisseries to ensure an ongoing dialogue and to stay up-to-date with the latest pastry chef trends. I also recommend that students try out the pâtisseries to sharpen their palates. A challenge and an ongoing interaction exist with the Institute’s students. We constantly raise the bar, to make them progress and ensure that they are of a good standard when they start working. I have great memories of Le Cordon Bleu students who carried out internships at the Ritz and at Ladurée. The interaction with the students is what gives me the greatest sense of satisfaction at the end of a working day. There is a good atmosphere and assimilation of knowledge in class. I trained many apprentices during my time on the Côte d'Azur. I found it easy to interact with them and have always enjoyed sharing my knowledge. I therefore naturally assumed that teaching was something that would appeal to me. One day, Chef Verger, who was part of my professional network, let me know that Le Cordon Bleu Paris institute was looking for a pastry chef. I didn’t hesitate as I was already well aware of the school’s reputation. I really appreciate the fact that here, the necessary time is taken for what needs to be done, to teach. To be a good Chef, team spirit is key. A Chef who is alone, without a team, is not a Chef but a worker. Some leadership skills are also essential to provide guidance in terms of research and innovation and to be able to create a close-knit team. It is essential to be open-minded, to travel in order to gain inspiration, to discover new products, new ways of working and managing. This will be reflected in the dishes. This open-mindedness also enables you to learn about the customers in the countries in which you have travelled, in a more personalized fashion. First cuisine memory?The very first fish I caught, gutted and ate. Favourite smell in cuisine? The smell of waffles in Brussels. An exceptional dining experience? Le Park 45 in Cannes by Chef Sébastien Broda for that extra special Chef’s touch and his sensibility when working with products, harmony of flavours and textures. French or world cuisine? World cuisine, because French cuisine takes inspiration from world cuisine. A meal in itself is a way of travelling! An anecdote about your career? I didn’t like figs and a Chef I was working for decided to prepare a fig based dessert. I am so glad that I tried it; otherwise I really would have missed out! It was a fig with honey, “vin jaune” wine and walnuts and I was pleasantly surprised! I have eaten figs prepared in the same way ever since.